A cheap 6” x 6” white ceramic tile makes a great substrate for a kid’s mosaic project. The secret is to turn it upside down and make a mosaic on the back of the tile. When the mosaic is complete, you have a place to stand your night time glass of water or your Mum or Dad’s morning-in-bed cup of tea. Seven standard size 20mm x 20mm mosaic tiles fit perfectly on each edge of the tile and once a lovely border is in place, almost anything that you put in the middle will look great. (Six Cinca 24mm x 24mm unglazed ceramic mosaic tiles also fit perfectly on each edge of the tile). Here is a selection of tiles to illustrate just what can be done. I have used this project plan with children aged seven and upwards. 1 Prepare the tiles by applying a coat of diluted PVA glue - I use Weldbond. 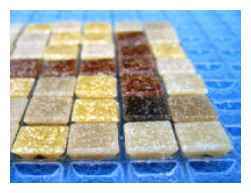 This seals the porous surface and improves the grip of the mosaic to the substrate. 2 The child now selects 24 whole tiles to be used to create the mosaic border. (This is an opportunity to do a little maths by pointing out that each side has seven tiles and there are four sides so how many tiles do you need for the edge?) Consider whether to use all light colour tiles, all dark or a mixture. 3 Point out to the children that each tile has an up-side and a down-side. However, allow each child the freedom to choose which way up to place the tiles. Smooth side up is best but grooved side up produces some interesting effects. 4 Use Weldbond glue to stick down the outside border tiles taking great care to space them evenly and to line up the outside edge of the mosaic tiles with the outside edge of the substrate tile. This stage usually needs close supervision as many children find it hard to grasp the concept of even spacing. However, once they have tried making one edge and been shown how to adjust the tiles to achieve even spacing and no edge overlap, they can then make progress un-aided. 5 Create some central motif - the initial letter of the child’s name is a simple one to make. Choose either a light colour or a dark colour for the motif. 6 Fill in the background space using a contrasting colour to that used for the central motif. Steps 1 - 6 can be done consecutively on the same day, or spread over two or three days. This depends on other timetable issues and the number of children participating. 7 Leave mosaic to dry. 8 Grout the mosaic using black grout. Make sure to fill the gaps under the mosaic tiles on all four edges. I usually ask the teacher to pick out some children who can be trusted to work carefully with potentially messy materials. Rubber gloves and protective clothes (old adult shirts or aprons) are essential. An old sheet or bath towel is also helpful to protect the floor or work surface and contain grout splatters. 9 Clean the drying grout off with handfuls of newspaper. Do not use sponges as this creates too much mess and often makes the grout too wet. 10 A slightly damp cloth can be used to remove any spots of persistent grout. Use distilled (clear) vinegar for the final cleaning of the mosaic and buff to a shine with a dry cloth. Some children may need additional help with the spacing and placing of the tiles. For these children I would advise making a pattern of mosaic colour using whole tiles. I have found it helpful to have a cardboard template prepared in order to mark out the exact placing of tiles. The pictures below illustrate the process and show some examples of colour patterns. When working with children aged 4-7, I often use a variant of this project design. I use the smaller, pre-cut 10mm x 10mm mosaic tiles and an essential piece of equipment - the Waffle Board. This is a pre-formed sheet of thin plastic with a grid of depressions exactly the right size to hold the mosaic tiles. A picture speaks a thousand words…. 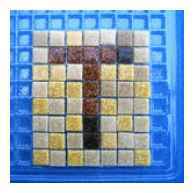 1 Using this method, the children need to fill in a square of 14 x 14 of the small mosaic tiles. I use masking tape on the waffle board to mark out the area that has to be filled in. 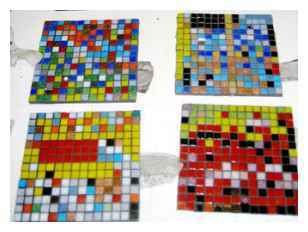 A few pieces of millefiore or mirror glass add to the appeal as long as it is not over done - 1-3 pieces per mosaic. 2 As the small mosaic tiles are laid, the supervising adult needs to cover completed sections with clear adhesive tape. You can buy rolls that are 5 cm wide. Each piece of tape added on top of the mosaic needs to overlap a previous piece so that when the work is complete, it is covered all over in clear adhesive tape. 3 Now you can just lift up the mosaic like a sheet of paper. The tape will hold it in place. Don’t cut off extra bits of tape that stick out past the edge of the mosaic - you can use them later to improve the pressure of the mosaic on the adhesive you apply to the substrate. 4 Next you need to apply adhesive to the prepared substrate tile. You need a good covering so that each of the mini 10x10mm mosaic tiles will get glued, but not so much that it all oozes up between the tiles. 5 Press the mosaic strongly into place and use any excess adhesive tape to wrap around to the underside of the substrate, securing the mosaic in place and improving pressure. 6 Leave the mosaic to dry, perhaps using some weights to improve the bonding between mosaic and adhesive. 7 Remove the adhesive tape and grout as normal (see 8-10 above). Any small tiles that have not stuck properly can be glued in place directly back onto the substrate before grouting.